When I was a kid I used to love fall mornings. The neighborhood kids would gather in front of our house and play two-hand touch with a Nerf football in the street for hours. Back then, we looked forward to playing the game on weekends instead of watching it on TV – and obsessing about it during the rest of the week. For a couple hours every Saturday and Sunday in the fall, we became our heroes. I used to throw lobs to the sideline for my buddy Scott, who would fall into the yard with his tiptoes still “inbounds” on the curb. We used to practice these throws and “circus catches” that we saw on NFL Sundays. Despite the fact that we grew up in the ‘burbs of Seattle, in our eyes no two players had a better knack for this kind of play than Dan Fouts and John Jefferson. Playing street football, the game usually ended as soon as one kid tripped and scraped up his hands on the asphalt. If the game ended early, we went right back to practicing those diving catches into the yard – Fouts to Jefferson. During this same time, down I-5 in Seattle, a young Brinkhater began what developed over time into a full-fledged man-crush on another NFL football player. Steve Largent you’d probably guess? Even young Hooty had a #80 Seahawks jersey… but not Brinkhater. No, back in the 80’s Brinkhater was then known as Mudbonelover. 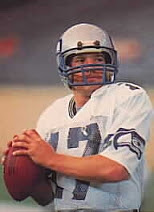 Yes, the object of his affection was none other than Dave Krieg – or DAVID Krieg as I’m sure Brinkhater would correct me. I can only imagine what the street football games were like in front of Mudbonelover’s house. I bet he proudly donned his #17 and sent one of his buddies on a deep post to the streetlight on the first play of the game. He’d drop back and throw a picture-perfect bomb for a score, a-la Krieg to Daryl “Deep Heat” Turner. He’d close his eyes and hear the roar of the Kingdome crowd as they did the “wave” in his honor. On the the next possession he’d get distracted by a passing VW bug and the Nerf would slip out of his little hands and get scooped up and returned for a score the other way. Indeed, Brinkhater’s admiration for Mudbone has endured to this day as can be witnessed here, writing under his pen name, Tammy Tokas. Ol‘ Mudbone – the epitome of NFL mediocrity. Consistent, if unspectacular. Good enough to play 18 years in the NFL but retired having never led his team to the Super Bowl. It might surprise you to know that when he retired, his 38,147 yards placed him in the top-ten all time, despite a pedestrian 81.5 QB Rating. Does this resume sound a little like the one being compiled by somebody else we know? Indeed, if you calculate Alex Brink’s numbers in NFL terms, his rating of 89.6 looks pretty good next to Mudbone’s…and get this: according to statistics on ESPN.com, Alex Brink has NEVER fumbled. So Brinkhater, what happened to you? How could you have embraced one quarterback for his workman-like, over-achieving, underdog persona as a kid, only to turn your back on those same qualities 20 years later? You are currently browsing the archives for the Dave Krieg category.